So you want to know how to create a successful Youtube channel in 2018. You’ve published a few videos on Youtube but your Youtube videos are not attracting views traffic. A lot of Youtube creators believe that to create a successful Youtube channel you basically just need luck. f Lady Luck is smiling on you, you’ll turn into PewDiePie and make millions, right? If you want to know how to create a successful Youtube channel, you have to understand the rules of the game. And there are a lot. I am obsessed with media. After all, I am a digital marketing expert. I love learning all the tricks and secrets that go on behind the scenes. 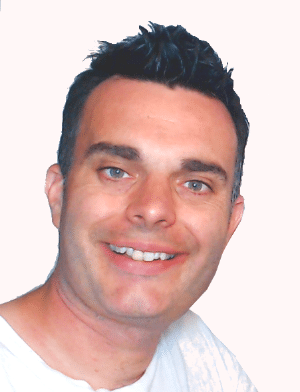 Throughout my years in the business I’ve extensively studied online marketing, storytelling, branding, video production, and social media marketing. And all these elements are important when you look at how to make a successful Youtube channel. I would love to share my knowledge and passion with you in order to help you get started on Youtube. And so I’ve created this huge guide to making a successful Youtube channel. That said, I definitely welcome your own insights and comments. If you have experience making Youtube channels or in marketing in general, or if you’ve got an opinion to share, I would love to hear it. In this guide we are going to look at how to create a successful Youtube channel quickly but professionally. You will learn how to create Youtube videos more quickly, how to create a successful Youtube channel that attracts subscribers, and how to get your Youtube branding spot on. And you’ll learn how to do all that while saving a lot of time and money. If you want to know how to create a successful Youtube channel that pays, you have to understand the keys to success on Youtube. Consistency (make it very easy to produce ). We will look at these points in detail in this Youtube guide. And in this article we will be starting by looking at how to create a successful Youtube channel from the ground up, so that you are ready for success before you even post a Youtube video. One of the most important things to get right from the very beginning is your overall Youtube channel. If you have a good channel template and you know what your Youtube videos should be about, you will have the foundations for success. Here are the best Youtube channel tips and tricks. One of the most important tips for creating a successful Youutube channel is to get your branding right and stick to it. Youtube Creator Academy states that you should create a clear voice that is easy to understand, and you should stick to that voice. To create a successful Youtube channel, make sure to stick to your branding. For instance, if your Youtube channel is all about fun video games (Nintendo games, for instance), then stick to that. Make everything communicate that Nintendo-style fun and cuteness. All these elements should carry the same message and the same personality. That way you will end up with one clear voice. The overall concept here is to have one very loud an very clear brand persona that remains consistent throughout everything. Let’s look at an example of a successful Youtube channel: Nike. If we take a look at Nike’s branding we can see that it is consistent across everything. A big part of knowing how to create a successful Youtube channel that pays is knowing what content to cover. If you are a creative person, you will be tempted to create videos around a variety of topics. It feels like you’re in a candy store. You get to choose to make videos about anything you want. Why would you stick to just one thing? To make a successful Youtube channel it is very important that you stick to similar themes in your Youtube channel, for a number of reasons. 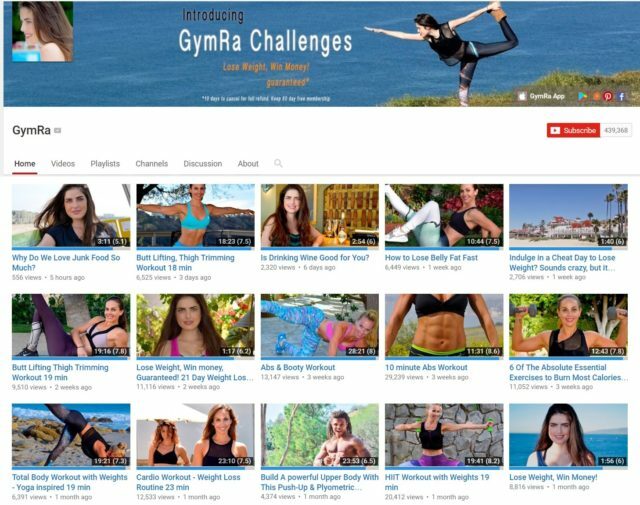 Gymra is an example of a successful Youtube channel about yoga. It has over 400,000 subscribers. And they always post the same thing: yoga videos. As you can see, Gymra always posts videos on the same topic, yoga. And they also always use good looking people (normally female) who all look like they belong in the same demographic (20-30 year old women who are into natural health). Even the background locations share a common theme. To make a successful Youtube channel, you need to be consistent. By producing content around one subject you will attract people who are interested in that topic. If you muddy the waters you end up creating a space that is not perfect for anyone. As with all demographics, its about creating a space that is perfect for a specific type of person. One of the most important aspects of making a successful Youtube channel is demographics (the group of people you are targeting). If you want to grow an audience on Youtube, you have to know who is in that audience. The more you know about your demographic, the more you will be able to market to them. There are many excellent guides to demographics available online. So let’s just cover some of the important parts of demographics. Using this data you can then target your audience more accurately. This is the best way how to grow a successful Youtube channel. For instance, let’s say you’re making a Youtube channel about movies and in particular Netflix. You want to look professional, so you wear a shirt and tie. But your audience likes to chill out on Netflix. They prefer wearing relaxing clothing. So instead you put on your pajamas with those bear-shaped slippers, and you make a video in which you’re lying on your couch in those pajamas, sipping on hot cocoa. And boom, your audience totally gets it now. #demographics. Demographics are essentially about understanding who your audience THINKS they are and then reflecting that. The “THINK” part is very important. You want to reflect the way your viewers perceive themselves. 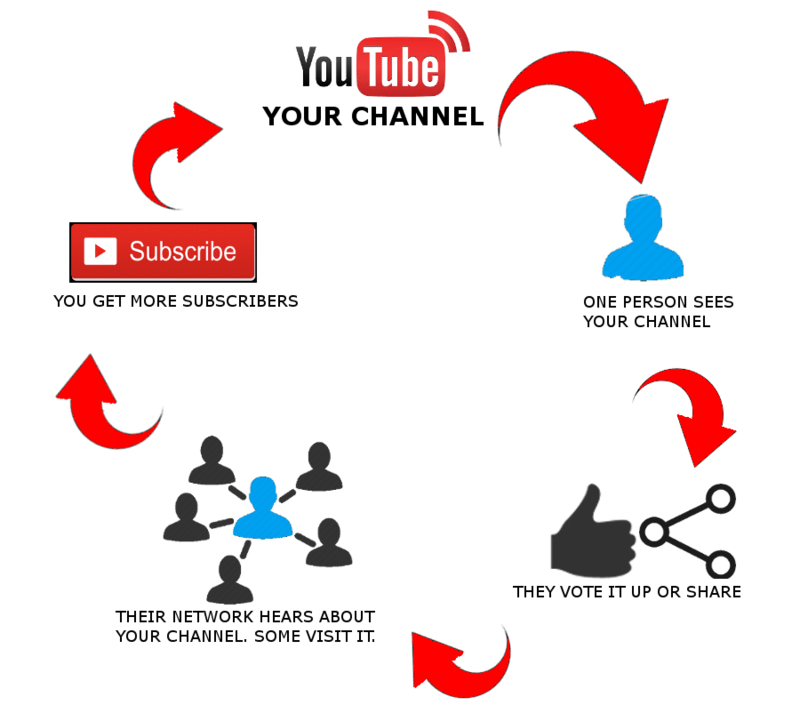 The image below shows the basic principle of how Youtube marketing works. One person sees your channel. They like it. People in their network hear about it. They visit your channel. They subscribe. Your channel grows. There are two key parts of this process. Firstly, knowing what one individual will like. And secondly, knowing what they will tell their network about. The first is the demography we’ve already covered. If you understand the individual people in your demographic, you can easily make them enjoy one of your videos. But how do you make them tell their friends about it. I’ve covered a lot on this topic in my guide to getting Facebook LIKES. Take a look. It will help you with Youtube too. The important thing to note is that making someone watch and like your video is not the same as making someone watch, like and share your video. The moment you ask someone to share your video you are asking them to be associated with it. Their friends and family will know they like the video. And no doubt we can all name some online videos we enjoyed that we would rather not tell other people about. The easy way to do this is to make sure that a like for your channel makes someone look good (precisely what that means will depend on the nature of your channel). Always remember, a successful Youtube channel represents the people who subscribe to it. Make them look good by association and they will gladly share and vote-up your videos. 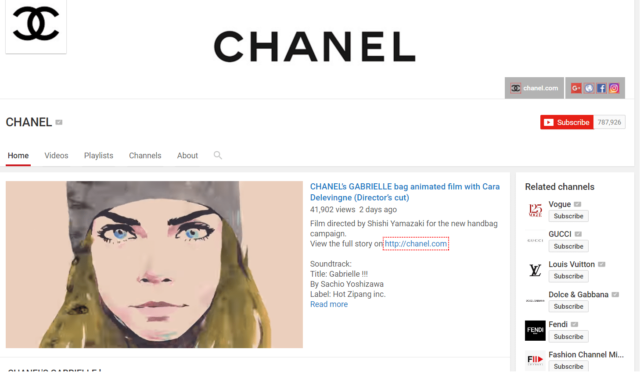 Chanel’s Youtube channel is designed to make their audience feel beautiful and popular. Who wouldn’t want to be associated with Chanel?! So, one way you can grow a successful Youtube chanell is to make your audience want to be involved is by making them look cool. But that’s only one way. There are lots of other ways to make your subscribers look good by association to your channel. Here are a few other popular ways. Youtube channels for charities make their subscribers look generous and responsible. So do activist sites. Science Youtube channels make their subscribers look intelligent. Fitness websites makes their subscribers look health conscious, fit, and possibly beautiful too. Movie and gaming Youtube channels make their subscribers look either fun, cultural, or “chill”. Make it so that subscribing to your channel makes your audience look good. To make a successful Youtube channel you need a killer Youtube logo / icon. According to QualityLogoProducts, “Your logo is a visual cornerstone of a company’s brand. Your company’s identity is visually expressed through its logo, which, along your company’s name’, is one of the main things that makes your business memorable.”. 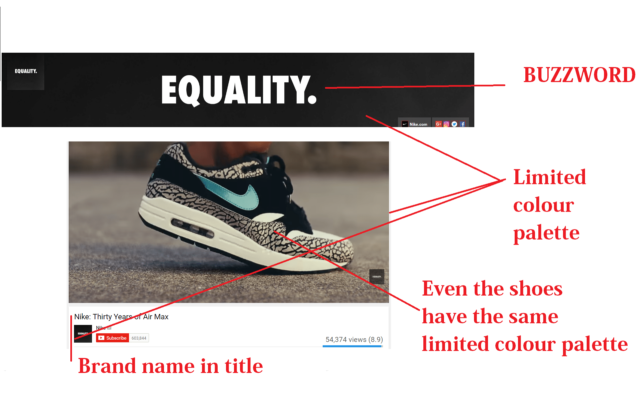 If you are launching a successful Youtube channel for a business you probably have a logo already, and you will likely use it for your Youtube icon (though this is optional; Nike do not use their logo, so you definitely don’t have to). There are several free online thumbnail makers that will help you to create a professional looking Youtube channel icon. One such service is Canva. But what exactly is a good Youtube channel icon? And what separates a good one from a bad one? If you are creating asuccessful Youtube channel icon from scratch then you will want to make sure it is of a high quality and that is both catches attention and communicates your brand. Your logo needs to fulfill the mission statement of your vlog. If your Youtube channel is your typical entertainment channel and the only purpose is to get as many hits as possible, then you will probably want a face icon with an over-the-top expression that grabs people’s attention. If you’re a small business, on the other hand, you will want to look professional. Either way, your logo should communicate your brand persona very clearly and should reflect the purpose of your channel. Using conventional logo theory, we know that a good Youtube channel icon should be simple and should convey the purpose and personality of your brand very quickly. That means that your channel icon should have limited details, limited colours, and be immediately understandable. The easiest way to test your Youtube channel icon is to show it to several friends and ask them to tell you what they think the channel is about and the emotions they feel looking at your icon. Their answers should match your brand persona. This is arguably the single most important idea for creating a successful Youtube channel. Because repetition is immensely important on Youtube. If you want to know how to create a video channel that pays, you really need to know how to produce a lot of good content with as little time investment as possible. Because pay = hits, and hits require a lot of videos. How many videos do you need to create a successful Youtube channel? Sometimes one. Usually hundreds. The average Youtube channel with more than 100,000 followers has been around for more than three years and has over a hundred videos (often thousands). So to put it simply, you are going to need to produce a lot of videos if you want to succeed on Youtube. Sometimes, this is easy. No doubt you have seen the thousands of successful Youtube channels who put out videos of themselves playing video games. In this instance, the content has been made for you (because the bulk of the content is the game itself). All you do is play through the game while recording yourself, then mix the gameplay and webcam footage. It could not be any easier. What about when you need to produce your own original content? Those times, content production is going to take time, and you are not likely to see a return on investment for several months. Put simply, most people need to produce lots of content with limited time and budget. And the only way that is possible is by recycling content. Look for all opportunities to reuse the work you’ve already done. You could reuse your clips. You could reuse sound effects. The best thing to do is to create a video template and a specific room of your house that will use for Youtube. That way you can keep the template of the video the same and you can keep the room the same. That’s 70% of the work done. All you have to do then is get in your recording studio (or room), use your pre-made video template, and you’re good to go. Maxamilian Dood is an example of a successful Youtube channel in gaming. He creates fantastic content for the Fighting Game Community (which I myself am a commentator for). Most of Maxamilian’s content is produced in the same room. It’s obvious the has put a reasonable amount of effort into making the room look good for his demographic. But the room has been the same for a couple of years now. And he has put out 3641 videos. Can you imagine if he had to recreate his background every time? That would add up to hundreds of thousands of hours work. By having the background permanently set he saves himself that much time. Trust me on this. By your tenth video you will be very, very thankful that you create templates. So, what templates can you create? Anything else you can use multiple times. You will save literally hundreds of hours by getting everything in place now. I cannot overemphasise how important this is. I cannot overemphasise how important this is when you want to make a successful Youtube channel. You want it to be so easy to produce videos that you can put one out even on a busy day. Consistency is one of the core ingredients of success on Youtube. Make it easier to put videos out and you will be more consistent. Trust me, I know how difficult it can be to find an ideal space to shoot your videos in. But your background is incredibly important. A moment ago we discussed the benefits of creating a permanent space that you can use repeatedly with minimal effort. But precisely what sort of space, or background, should you have? One of the first things people notice when they watch your Youtube video is the space you’re in. I once shot a gaming video in a room where there was a classical painting hanging on the wall in the background. People just didn’t get it. Why was I connecting classical art to gaming? I wasn’t, of course, but the audience won’t realise that, they will presume that everything in your video was intentionally put there. Find a space that communicates your brand. If you can’t find such a space, use an empty room and include props that communicate your brand (posters, art, any object that relates to your subject matter, etc.). Experiment to find the best background. And don’t be afraid to go minimal. Some channels succeed with an all-black background. 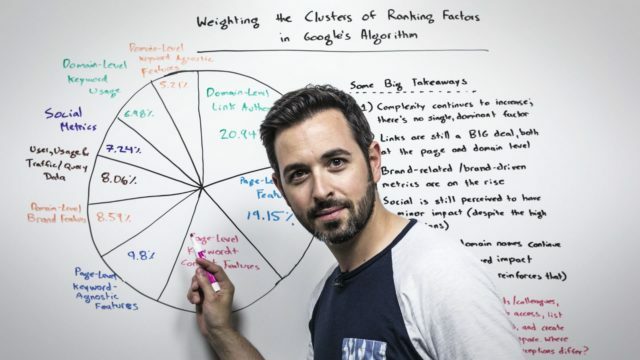 MOZ (the best SEO expert in the world) simply uses a whiteboard for this “whiteboard Fridays” series. So don’t worry about being minimal. Also consider a green screen, which are cheap these days and can be set-up quite easily. You can also play with your camera to produce an effect that blurs the background while keeping yourself in focus, something Graveyard Girl likes to do. In addition to visual design, consider technical matters, like filming in a quiet and well lit location. There are already many guides to doing this, however, so I won’t cover it here. Instead I will recommend you read VideoMaker’s Guide To Creating A Studio In Your Room. MOZ’s “Whiteboard Friday” just uses a whiteboard for a background. It works because it fits the brand. Getting up-votes might not be as important as it used to be. But getting shares across a variety of social media platforms is essential. One of the easiest ways to get likes and shares is to make yourself instantly likeable. There are many things that you an do to immediately make yourself more likeable. Some are obvious and easy (like snuggling a cat at the beginning of the video). Some are much more intelligent and challenging. For instance, there are many Youtube beauty channels that are run by people who know they are not the best-looking person in the world. Viewers respect the hell out of those Youtubers for their bravery (it’s not easy putting out a fashion blog if you don’t look like a model, it takes guts). Include those things in your video. If you’re creating a Youtube channel about pets, for instance, make sure you’re cuddling a pet in the video. Easy. But it will make people press the thumbs up button. One of the masters of this trick if Graveyard Girl. Take a look at the picture below. She is a beauty vlogger. Why do you think so many people would immediately like her videos? It speaks for itself. If you want to create a Youtube channel that succeeds financially, you can’t just get hits (unless you literally get hundreds of millions of hits). Part of the money on Youtube comes from Youtube’s native advertising. Another, arguably more lucrative part, comes from sponsorships. Companies will sponsor you for product-placements, for reviews, for advertorials. And there is potential for a lot of business through sponsorships. When you work with a Youtube sponsor, you are representing their brand. So naturally, sponsors are going to take a long hard look at precisely what content you put out before they sponsor you. In other words, be professional. And also create content that you think will attract the sponsors you want to attract. In this guide we’ve looked at how to create a successful Youtube channel that will start making money without spending the rest of our lives doing it. One of the most important parts of creating a successful Youtube channel is getting your channel right from the beginning. Once everything is set and in place you can produce high quality content quickly and economically, and that is when you will start to make profit. If you have found this guide useful, please share it. That way I will know I am doing something of benefit here. And I would love to hear your opinion on this article, or any questions you may have.